Enhance your domain research toolkit by our enterprise-grade web-based solution that helps you in searching and monitoring domains' data. 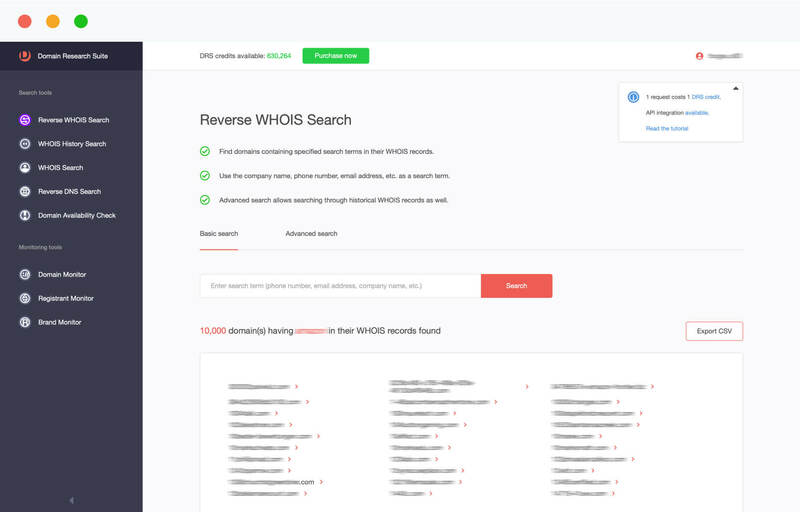 Reverse Whois Search Tool helps you find all the domain names corresponding to a particular ‘Search term’ such as a person or company’s name, phone number, email address or any other field from the WHOIS record. WHOIS History Search tool allows you to view relevant historical WHOIS records – and find out how a domain's ownership has been changing. 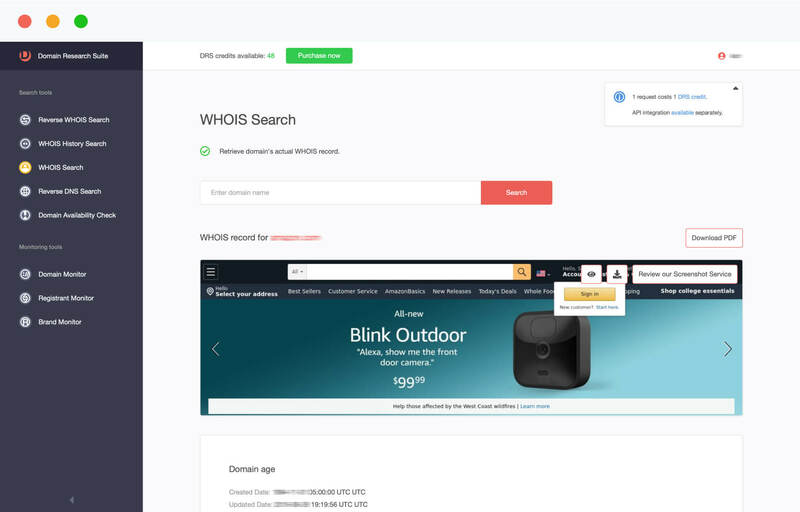 WHOIS Search tool allows you to obtain registration details, also known as the WHOIS Record, of a domain name or an IP address. 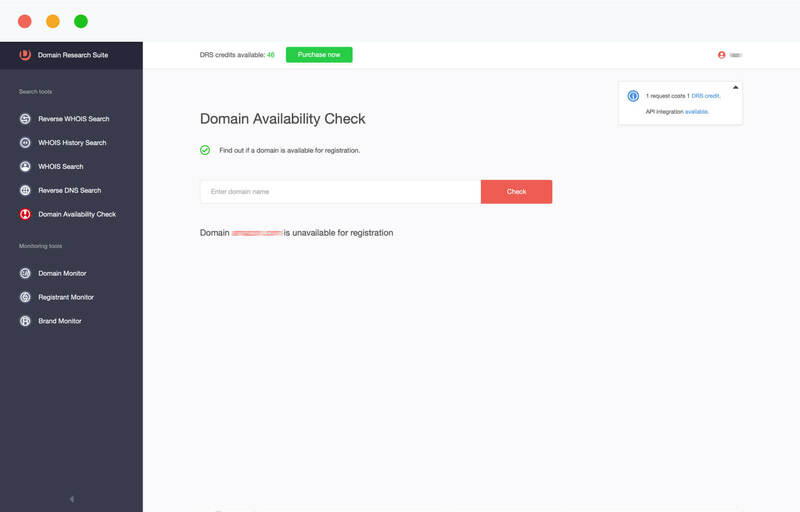 Promptly check domain name availability of over 2,864 TLDs with our reliable and fast Domain Availability Check tool – the most accurate, real-time and user-friendly tool available on the Internet. Get email notification alerts according to your preference. By simply adding the domain names to your list, you can proactively track any changes in your monitored domain’s WHOIS record, such as the Updated date, Created Date, Expiration Date, Registrant Info, Registrar Info and more! It’s an ideal tool for monitoring specific domain registrants so as to be alerted whenever their information appears in a newly-registered domain name. To secure your brand online, Brand Monitor Tool monitors exact matches and variations with all possible misspellings of your brand name and trademarks – or even keywords associated with your competitor’s brand. Protect your brand from infringements, phishing attacks and other nefarious activities that could possibly happen with regard to the brand you are managing or check on your competitors and their activities! If you purchase, sell, negotiate prices on, or assess domains, you will require precise and relevant information. Precise and exhaustive data is vital for analyzing and preventing cyber crime. For professionals in cyber security, domain WHOIS data ranks as essential to their work. Marketing researchers try to understand what consumers want. By using domain data they can identify various trends and the online marketplace as a whole. Law enforcement and government agencies often use domain WHOIS data to verify and check on domains or IP addresses. Get a detailed portrait of the domain owner and its connections with other sites, companies, people and so on. Payment processors and banks can safeguard themselves against Transaction Fraud with the help of precise and exhaustive data. Domain WHOIS data is vital when identifying fraud. Integrate our monitoring and search tools into your applications. Get instant access to one of the largest databases of WHOIS data through the IPA access. Quick and easy integration in a few minutes, without excessive programming! It used to search for domain records based on particular search terms(s). A query can be created with search terms such as name, email, phone, address, etc. This API allows you to view relevant historical WHOIS records – and find out how a domain's ownership has been changing. This API helps you find out if a domain name of your interest is available to be registered or not. Searches across all recently registered and deleted domain names and returns result sets consisting of domain names which contain term(s) that are specified by you. This API is perfect for monitoring specific domain registrants so as to be alerted whenever their information appears in a recently registered or expired domain name. This API helps you discover all connected domains hosted on the same IP address. This API helps you reveal all domains that use the same mail server. This API helps you find all domains that use the same name server. In today’s business landscape, it is almost impossible to be successful without setting up an online presence. What’s more, if you are launching a company or product, thinking about which domain name to use is a priority. In fact, it cannot be randomly picked as you must deeply connect with your target audience. But the domain registration market is highly dynamic, and it is advisable to secure domains of interest before someone else does. How can you do that? The first line of defense for companies that want to protect their staff or customers from bogus websites is monitoring domain names. Hackers will use variations of domain names to lure unsuspecting users onto portals whose purpose is to steal private information and drop viruses onto devices. You just in one step from making your business better!